Most of the surfaces on homes and buildings are painted or protected by a surface coating. Getting the job done right in the first place and a little basic maintenance can add years to the life of an architectural or decorative paint system. How often do you wash your car? People frequently think about washing their car, or at least from time-to-time, yet many leave Mother Nature to do all the cleaning on major assets such as houses and buildings. It’s important that houses are washed each year to maintain the appearance of paint finishes and to remove any build up of salt deposits, bird droppings, mould and other contaminants that can interact with surface coatings. Salt-blown areas that are not washed by the rain need particular attention and if these areas require repainting, it needs to be undertaken after thoroughly washing and preparing the surfaces. Galvanised steel and steel structures under canopies also require extra maintenance to remove salts. While these structures provide protection from the weather, they create aggressive corrosive environments. The length of time before a new paint system requires its first major maintenance depends on the condition of the substrate prior to painting and the level of care that was taken during preparation. It also depends on any interim measures that have been taken to address, for example, a failure due to a damaged substrate or failure of a previous coating. Be prepared to fix damage as it occurs, such as scrapes, hail damage or cracks. It is almost impossible to achieve an imperceptible finish in one spot over an existing system, so repair and prime the specific damage and repaint a wider area to provide an even finish. 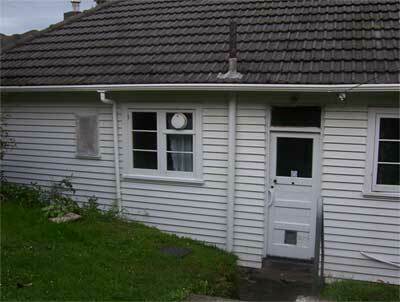 A quality three-coat acrylic system can be expected to perform on timber weatherboards for 7–10 years. An oil-based or alkyd system may only last 4–6 years. These numbers reduce to 5–7 years and 1–5 years respectively on window sills and other slanted surfaces with greater exposure to damaging ultraviolet light from the sun. A great number of failures on timber surfaces are due to movement or deterioration of the timber underneath. Performance on metal can vary widely and, excluding protective systems which are a speciality area, a standard acrylic system can be expected to last 5–7 years on metal, while an alkyd system may only last 1–3 years on the same surface. When dealing with steel, AS/NZS 2312:2002 Guide to the protection of structural steel against atmospheric corrosion by the use of protective coatings gives excellent coverage on the life expectancy of systems and maintenance issues. Transparent wood stains require more regular servicing as the wood is not completely protected from ultraviolet light and can break down underneath the coating. 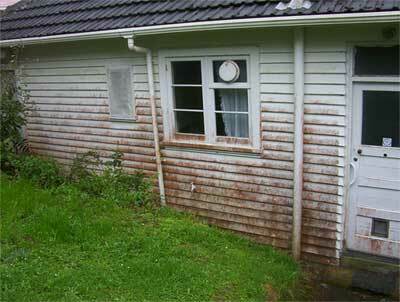 Most stains recommend selective recoating after two summers to ensure areas showing erosion are repaired. Care has to be taken not to over build other areas where the stain remains intact. It’s easy to forget that as an island nation our climate is dominated by our proximity to the sea. Even Palmerston North has a harsh environment because of prevailing winds. Paint designed and manufactured for use in New Zealand must take into account our predominantly marine environment and high levels of ultraviolet exposure. The composition of our paints is markedly different from other regions around the world. Such environmental exposure has a huge impact on all coating systems. Protective coatings, for example, have standards that reduce the expected time to first maintenance from 15 years to 2 years depending on how exposed the site is to the elements! There are three processes that act at different rates on painted surfaces – sun, moisture and temperature differences. Direct and reflected ultraviolet light degrades the binder and pigments of paint, resulting in chalking, erosion and colour loss. Eventually, all grades of paint suffer these affects to some degree, but lower quality paints will fail in these ways much earlier. The binders in acrylic paint tend to resist the effects of direct light better than the binders in oil-based or alkyd paints because the alkyd paints absorb the ultraviolet radiation into the binder. Moisture in the form of rain, snow, dew, condensation or sprinklers present a number of challenges to a painted surface. As well as surface effects, all coating systems (apart from weathertight membranes) allow some liquid or water vapour through. 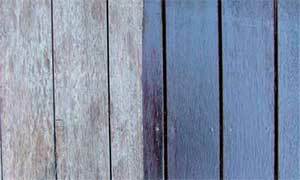 Where timber has been used, this can lead to swelling and shrinking over time, which can force the paint to fail due to movement in the substrate. Temperature can also expand metal surfaces and have an impact on wood as it drives off moisture content. To reduce the impact of temperature on a substrate, use light colours or paints that incorporate special pigments that reduce the absorption of heat. To ensure the longevity of a paint system that is exposed to extreme elements, annual inspections should be carried out and running repairs made to any areas that are damaged or under stress. Images courtesy of JT Propertywash. The decisions made when painting influence what type of maintenance is needed and when it will be required. To get the best out of a paint system, a good deal of effort needs to be focused on preparing the surface. As a new paint film dries it exerts forces on the surface below. Where there is a powdery surface or a loose paint system underneath, movement can occur and a failure at the substrate or old coating can result. Skimping on surface preparation can lead to a range of immediate issues or to the early failure of a system due to underlying issues. Is there any moss or mould present? A quick wash with water will not remove spores or small particles, a chemical treatment is required. Moulds can regrow underneath new paint films popping them off the surface. Is the surface chalky or dirty? Proper cleaning involves both washing and rinsing. Cleaning solutions bind up dirt and small particles so that they are washed away from the surface, rather than just moved around. removed and replaced with new materials. Adhesion tests should be carried out on any previously painted areas. Check with a reputable paint company or tradesperson to get the details on an appropriate adhesion test regime. Some of the best actions to ensure the longevity of a paint system must be done at the time of painting. Start by selecting a quality paint specifically designed for exterior applications. Making paint go a little further can have long-term impacts on the performance and time to first maintenance. Paint comes with a recommended spreading rate that is designed to ensure that when the paint has dried there will be a film 25–35µm thick per coat. This is important as the final film thickness of a coating system is made up of the high and low points achieved during application. Paint that is thinned or over-spread will result in a thinner film coat. Even 10% thinning can result in a reduction of almost 30% in the dry film thickness. Natural exposure studies with panels at a 45° angle show that one coat of paint can fail in less than a year. Using the recommended number of coats is critical to achieving long-term performance. Ultimately, the more care and preparation invested at the start of the project, the better the outcome. Regular maintenance of exterior coatings will also ensure the system performs well and protects the building beneath.